Raveen Hair Replacement specializes in hair replacement and treatment because we understand the social and cultural importance that has long been placed on a full head of hair for both men and women. Free private consultations: Our trained technicians understand that every individual is unique, which is why we’ll sit down with you, focus on your needs and concerns, and develop a treatment plan customized for your specific case, whether you want to achieve the look you were accustomed to before experiencing hair loss, or are looking to completely freshen up your style. Contemporary replacement technology: We use only the latest and safest hair repair treatments, including scalp treatment, full head bonding, perimeter bonding, hair additions and hair extensions. For hair-by-hair reconstruction, we match your hair sample with the finest real human hair to ensure you get the proper color, density and wave for your style, age and preference. 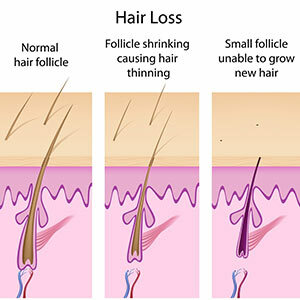 Then, each hair is recreated follicle by follicle, in keeping with your scalp’s particular growth patterns. Because the majority of the work is carefully prepared beforehand, in most cases the reconstruction process can be completed within 90 minutes. Hair care and styling: Because our experts work with unparalleled skill and intuition, we also offer basic hair services so that you don’t miss out on cuts, cleaning, conditioning, styling, coloring and scalp treatments. Products and supplies: We carry a full line of Paul Mitchell products to give you and your hair the care and pampering you deserve, including shampoo, conditioner, and the latest styling formulas. We also offer supplies to meet all your hair replacement needs, including hairpieces, toupees, hairpiece tape and hairpiece glue. Open your world up and explore the hair replacement and care options Raveen Hair Replacement offers. Give us a call at 336-852-7449 to learn more about our services or to schedule your free, private consultation today.